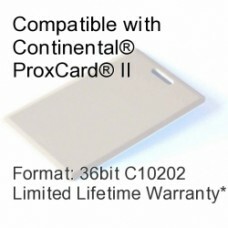 This Clamshell Proximity Card is compatible with Continental® ProxCard® II and is programmed with 36 bit format C10202. This item is programmed to your specifications and is designed for access control, event security, and time & attendance tracking. It includes a Limited Lifetime Warranty against errors in manufacturing. Save up to 50% with our high quality products over other brands. 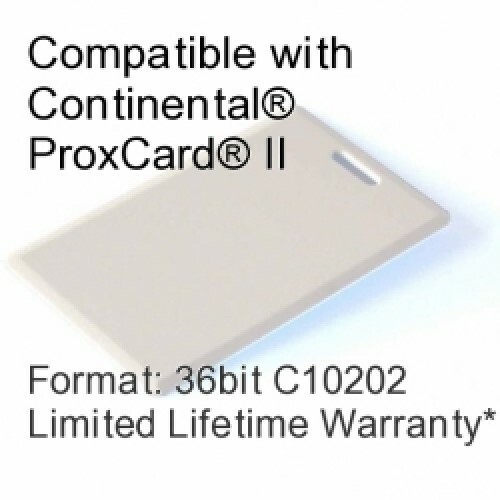 The CshPrx-C36 card has a vertical slot punch and is extremely durable and is perfect for when you need a simple and reliable proximity card. Clamshell cards are not directly printable but can be used with printable id badge stickers. This card is 2.125" wide and 3.37" tall.